Samsung SGH-P300 is a credit card sized GSM mobile phone which packs a full-featured GSM cellphone features into a very small, thin, and light package. Features include a megapixel camera with flash, Bluetooth, speakerphone, email, and high-resolution landscape color TFT LCD display. 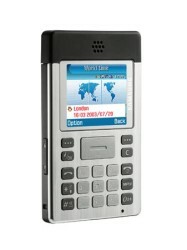 MobileBurn reviewed the ‘credit card phone’ and recommended the phone. MobileBurn concluded that apart from a mediocre MMS editor and the lack of a memory card slot, the only shortcoming the Samsung SGH-P300 has it its audio quality. Sadly, that one is a major shortcoming, and will be a deal breaker for many folks. That really is a crying shame since the P300 does almost everything else exceedingly well. Sure, its camera is nothing to write home about, but the P300 has a great user interface, physical design, and battery life. If the audio was there, it would be the perfect business phone. But it isn’t perfect. If you are a heavy voice user, you might want to look elsewhere for your thin fix. If you are not a big talker, then I think you’ll agree with my somewhat reluctant decision to still give the P300 a “Recommended” rating. Just consider it a soft one.